PARIS — France and Germany agreed to study building together a new fighter jet to succeed respectively the Dassault Rafale and Eurofighter Typhoon following a July 13 joint Cabinet meeting held here. Such a defense project marks a further step in the pursuit of a strong European defense, as a Franco-German combat aircraft would reverse a long-standing rivalry in export sales of that critical weapon system. The two countries seek to draw up a roadmap by mid-2018 to develop the next-generation fighter, as set out in a document issued after the high-level meeting led by President Emmanuel Macron and Chancellor Angela Merkel, Reuters reported. 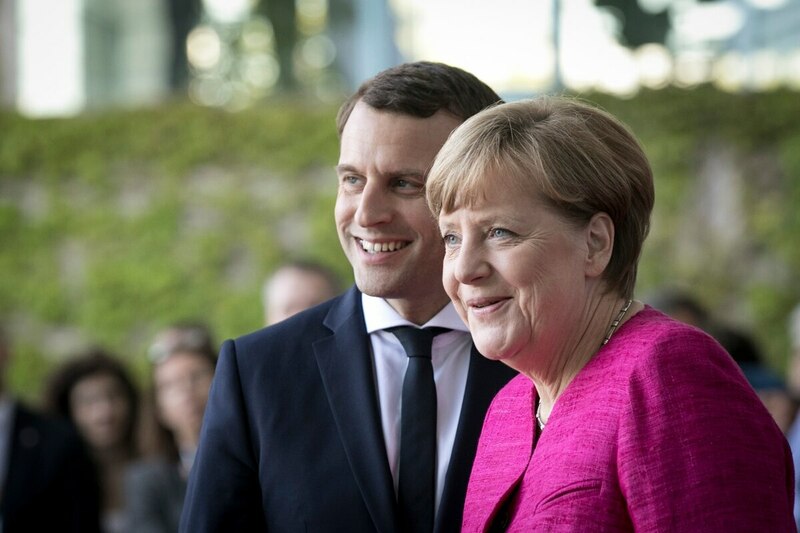 "Today, there are too many European standards and qualifications, and sometimes there is competition among Europeans internationally," Macron told a joint news conference with Merkel. Such a Franco-German project casts doubt on the Future Combat Air System demonstration program, a £1.54 billion (U.S. $1.99 billion) plan for Britain and France to develop and build a demonstrator for a fighter aircraft that could be manned and unmanned. Brexit has raised many questions over Britain’s future role with its allies on the continent. "This is a long way from arrival but an important political sign has just been made," Jean-Pierre Maulny, deputy director at think tank Institut des Relations Internationales et Strategiques, said at the official garden party held on the eve of the Bastille Day military parade. A European project makes sense as a country can no longer afford to build a new fighter on its own, he said. France has raised the new fighter project at a sensitive time as Germany heads for a federal election in September, said Jean-Paul Palomeros, former head of NATO’s Allied Command Transformation unit at Norfolk, Va.
"A fighter jet is a highly sensitive subject in Germany," he said. Germany came to discuss economic reform in Europe, while France wanted to talk about defense projects. Those were both highly valid topics, but the electoral timing for Merkel meant military matters were especially tricky subjects, he said. "It is like France and Germany running trains on two different sets of tracks," he said. Dassault Aviation was ready to work with partners on a fighter "as long as the program was based on a cooperation that worked," Eric Trappier, chairman and CEO of the family-controlled company, said on BFM Business radio. Dassault has experience of prime contractor on the Rafale fighter, a program that was "ultra efficient," he said. Besides cooperating on a new fighter jet, France and Germany also agreed to set up cooperation for the next version of the Airbus Tiger attack helicopter and for air-to-ground missiles, Reuters reported. The two nations would also work together on acquiring tanks and artillery, and a contract would be signed by 2019 for a European medium-altitude, long-endurance drone, a project that includes Italy and Spain.